Shutterly Scary or Shutterly Stylish? Stylish or Scary? We love these high gloss shutters with a little twist of Halloween sophistication. The nights are getting longer, the days are getting colder, and it’s nearing the end of October – it can only mean one thing – Halloween’s just around the corner! 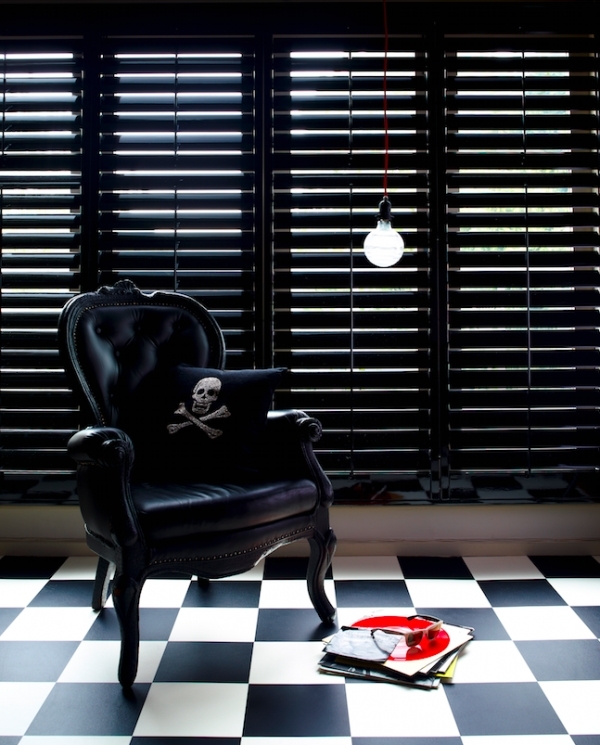 It can sometimes be hard to dress your home for this time of year, but if you’re looking to add a touch of the gothic to your home, why not invest in some dramatic black gloss shutters? Perfect for capturing the mood during this eerie time, the black gloss look also manages to look sleek and stylish all year round, creating the perfect atmospheric focal point for any room. Make it truly ‘spooktacular’ by adding some kitsch accessories, such as the skull and crossbones cushion and vintage looking armchair shown in this image. Flashes of colour, like the red lamp cord, bring the space alive. Shutters also serve a practical purpose during this time of year. Take advantage of the excellent heat retaining properties of, insulating your rooms by helping prevent hot air escaping through bar windows and locking the warmth indoors during the chilly season. With the slats pulled closed, you can be confident that very little heat will escape. Remember, by keeping your shutters closed on October 31st you might also stop any ghosts or ghouls from creeping through your house too – but we can’t promise anything!